I’ve written about the lexical contributions of Chinook Jargon to our Pacific Northwest English. But here’s a piece about English speakers’ fairly early view of CJ as a kind of slang of its own. leave rich piles of material to fertilize my imagination. Interesting to see ‘Chinook’ as a metaphor for ‘local slang’! 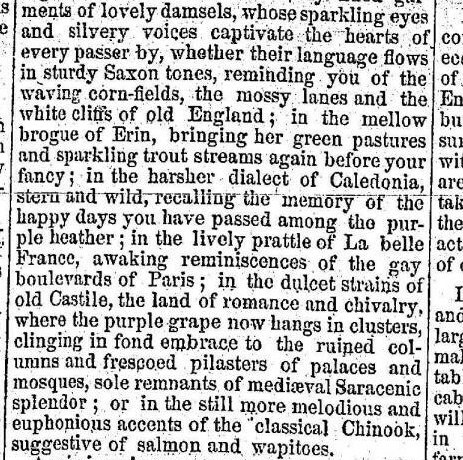 …or in the still more melodious and euphonious accents of the classical Chinook, suggestive of salmon and wapitoes. Now, that’s so over the top that it’s obviously a backhanded compliment.